‘Barcoo’ possibly derives from a word for ‘river’ in the Birriya and Kungkari languages of the area. Henry Kendall wrote a poem in the middle of the 19th century celebrating the river, but through the late 19th century the term came to be associated with aspects of life in the outback, usually with reference to the problems experienced there. 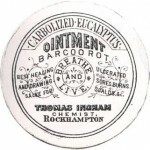 Barcoo rot was first recorded in print in 1869 in The Darling Downs Gazette and General Advertiser. 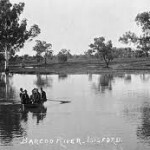 By the 20th century, the term was being recorded in many places outside of Queensland; the term Barcoo sore was also used. By the middle of the 20th century, the term was only being recorded in a historical context. Again, by the middle of the 20th century, there was little evidence of the term being used except in an historical context, suggesting the illness was either differently understood, or eradicated by developments in medicine. There are a number of other uses of Barcoo in Australian English, such as Barcoo grunter for a type of fish and Barcoo grass for a type of grass also known as Flinders grass. As a place name, ‘Barcoo’ has been extremely prolific in shaping the lexicon. The Barcoo River also gave its name to a Royal Australian Navy frigate, HMAS Barcoo, which served from 1944 to 1964. This entry was posted in ANDC, placenames, rural Australia and tagged Barcoo, Barcoo dog, Barcoo grass, Barcoo grunter, Barcoo rot, Barcoo shout, Barcoo sickness, Barcoo spews, Barcoo vomit, illness, outback, Queensland, river, rural Australia by Amanda Laugesen. Bookmark the permalink.